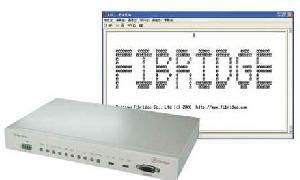 Ethernet interfaces integrated, you can make any choice of the three interfaces in one device. Its transmission distance is extended to 4km by 1-pair twist pair at 2M speed. FBDSL1000 is designed with 16TC-PAM code according to ITU-T G.991.2 and ITU-T G.994.1, which can improve the transmission performance and economize resource. As the new generation product, FBDSL1000 has not only the technical advantage but also very simple installation and maintenance procedure at the same time. It is the best solution for the customers. 10/100Base-T interface accordant with standard IEEE802.3 and 1Mbytes buffer inserted. MAC address list inserted and 4096 MAC address available. E1 interface accordant with standards as ITU-TG.703G.823 and G.742. Easy to install and operate. Working preferences by DIP switch and software control. AC110~240V or DC48V power supply optional.